September 2014. After more than three years of demolition and construction, “The Lauren” opens for people to move in. The address has been changed to 1061 Broughton Street. June 11, 2012. First night of public hearing for the rezoning. After three nights of hearings, City Council approved the rezoning, virtually the same as it first was proposed in 2009. May 15, 2012. City Council accepted the staff report as-is, ignored WEN letter about errors/omissions/misrepresentation of fact, and refered the application to go to public hearing. February 9, 2012. Westbank Projects Corp and partners held a third Open House. The essential facts (height and density) are virtually unchanged since the initial application in 2009, but space for Gordon Neighbourhood House and Qmunity had been quietly removed from the plan. The night before the open house, Westbank suddenly added a proposal for a mini-park to close Broughton St. beside the proposed tower. Through inquiries, WEN learned that there was never any written agreement between Westbank and Gordon House. Just a handshake with CEO Ian Gillespie. Also, we confirmed that in its initial pledge of support for the rezoning, Gordon House had not consulted the community — there was only one line in the minutes of a director’s meeting saying the topic had been discussed among directors with a presentation from architect Henriquez. January 26, 2012. Notice of an Open House for Version 3 was circulated. (No notice of the Open House was posted on the development application sign at the site). December 23, 2011 – Version 3 of the proposed rezoning was posted on the City’s website (just prior to the close of business for the holiday break). November 30, 2011. Amended rezoning application for revised Version 3 of the submitted proposal. Summer and Fall of 2011. Periodic checks of the City’s website showed no reference to any new information. Spring of 2011. Apart from the disruptive and wasteful demolition of the 30 year old institutional building at the site, there were no updates or information provided about the project. April 16, 2011. WEN Walk and neighbourhood rally at St John’s Church. April 11, 2011. Demolition work begins inside the church. More details are here. After major disruptions in the community, the demolition ended in June. April 7, 2011. City issues demolition permit for St. John’s Church. March 2, 2011. In January, the owner of the property at 1401 Comox Street (St. John’s Church) applied to the City to demolish the building. Previously the developer had indicated that he would not proceed with demolition of the building until the rezoning application was considered by Council at a Public Hearing. In late February, the property owner removed the stained glass windows from the building and left these window openings boarded-up. 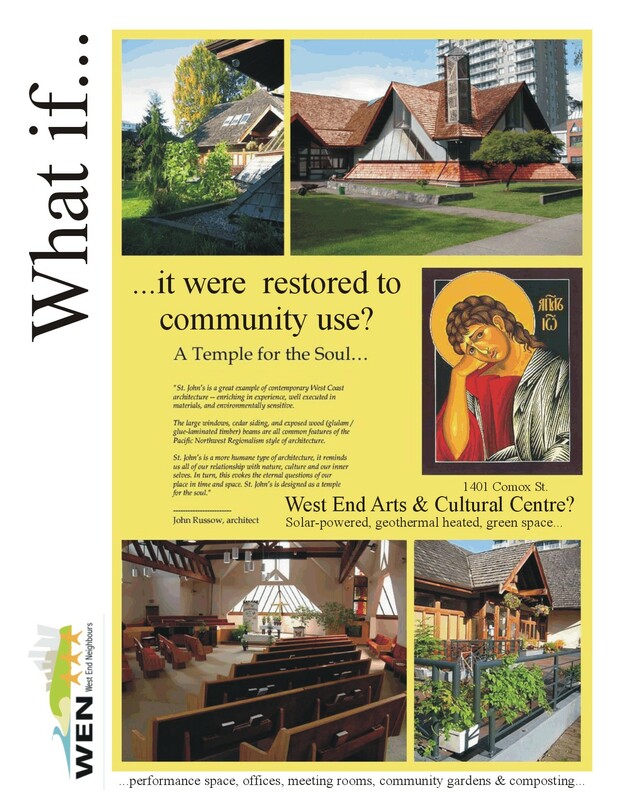 West End Neighbours forwarded a proposal to the City and the property owner requesting a delay of the demolition until the City or Park Board could explore opportunities to purchase the site and make it available for community use. There were no responses from the Mayor, Council, or Parks Board. More information about WEN’s proposal is located here. February 10, 2011. The fire department was called to the church to discover a ritual fire ceremony taking place inside the church. Described by Ian Gillespie as a fire hazard, the community was gravely concerned that Gillespie arranged for this fire on his property without a permit from the city and without water or a functioning sprinkler system in the building. Local residents’ lives and property were jeopardized by this act. Westbank Corp., the Peterson Group and Henriquez Partners architects continued to ignore the community and placed the safety of the surrounding neighbours at risk for their own purposes. The Fire Department investigated the situation. However, as April 16, no report was issued issued publicly, despite requests. For the full story, see Fire department called to 1401 Comox, discover ceremony ablaze. January 26, 2011 – Westbank owner Ian Gillespie announced in the West Ender that he has applied to the City for a demolition permit because of the hazards posed by fire, insurance risks. This demolition permit application contradicted the developer’s promise not to demolish the Church “prior to Council consideration of the rezoning application,” as conveyed to WEN by the Vancouver City Director of Planning, Brent Toderian in a November 2009 e-mail message. This decision came after Westbank had failed to secure the church since it purchased the property and then cited fire hazards and vandalism as a cause for the hasty reversal of its commitment to the community. This church had special significance for the community, with its 100 year history of progressive social attitudes and activities, including engagement in the struggle for the rights of the LGBT community and minority groups. January 26, 2011. A neighbour noticed a hole cut in the metal garage door bars. It was repaired January 26, 2011. The community explored other ways to find creative solutions to save the church as a community resource for West End residents. December 3, 2010. This application was temporarily on hold, but Henriquez Partners Architects and public relations firm Pottinger & Associates (working for Westbank and Peterson) continued working to manufacture consent for the rezoning, with private meetings, a new website, systematic misinformation and misrepresentation. The controversial Stratcom phone survey of West End residents that was commissioned by Westbank was part of this effort. And after numerous requests, the public feedback to the City on this project was put online, showing 78% opposed at the developer’s April open house, and 71% opposed from among 536 letters. November 6, 2010. Another arrest was made and 24-hour security was on duty for five days. Finally Westbank secured the building. November 5, 2011. After numerous requests over several weeks to Westbank about re-securing damaged doors at St. John’s, there was lots of activity. This followed three or four visits by police to find and boot out interlopers over the last two weeks. November 4, 2010. Again the police were called to St. John’s at 1:00 a.m. Two squatters were caught. Two weeks after the last major break-in call (this is the third call to police), the developer had done nothing about damage to the doors. Concerns were raised again with Westbank. November 3, 2010. Security company reported about 20 holes in basement walls due to metal and wire theft. November 2, 2010. Basement door in front was found propped open again. Mid-October, 2010. Signs of another break-in. Door was re-secured. October 8, 2010. The City issued a permit to Westbank Projects Corp. and Peterson Group for “selective removal of building components such as stained glass and monuments.” The owners had violated two bylaws, first by placing a fence encroaching on public property around the church, and second, by putting up a sign that contained serious misinformation. Security system was not used, may be shut off. August 31, 2010. The Mayor announced that application for a 22 storey tower with 500% increase in floor space would NOT go to Public Hearing for a while, to allow for more consultation. August 5, 2010. Metal fencing was erected around 1401 Comox, St John’s church, cutting the volunteer gardeners and community off from the gardens and church grounds. August, 2010 – Westbank shut off water for the church gardens and lawn forcing local residents to find another water supply to maintain the church gardens for the community. July 20, 2010. A third Open House was scheduled but the City’s website announced that the Open House had been cancelled by the applicant. Inquiries to staff found that the developers had cancelled to do further work on the submission. July 15, 2010. Selected residents began receiving yellow cards in the mail announcing a third Open House on a 22-storey tower proposed under the STIR program. April 20, 2010. An Open House was held for Version 2 of the proposal. March, 2010. A revised application was submitted for Version 2 of the proposal. November 29, 2009. An Open House was held for Version 1 of the proposal. Late fall, 2009. A proposal was announced for a tower built under the STIR program for market-rate rental apartments. October, 2009. The rezoning application was submitted for Version 1 of the proposal. September 2009. Sale to Westbank/Petersen Group was completed for $4.25 million, less than the asking price. Soon after, Westbank’s property manager agree to allow volunteer community gardeners to continue with watering, lawn and garden maintenance. July and August 2009. The Globe and Mail reported that the United Church Conference (UCC) Executive Secretary Doug Goodwin approached Ian Gillespie, owner of Westbank Corp.
A number of offers to purchase the St. John’s property were made by other spiritual, religious, and possibly community organizations. Although the City’s Real Estates Services department considered purchasing it, and said “Our office has been notified of the listing from many different sources and is being reviewed,” the City did not purchase it. July 6, 2009. Applications for STIR projects began. June 19, 2009. Short Term Incentives for Rentals (STIR) bylaw was passed by Vancouver City Council. June 2, 2009. Staff report on Short Term Incentives for Rentals (STIR) released. January 2009. With the congregation disbanded, the single mother rental tenant, her daughter and all community groups evicted, the ownership of the church was transferred to the UCC and put up for sale at an asking price of $4,495,000. The UCC says it wants to the church and property to go towards a use that would benefit the community. Circa 2005. Just 24 years after the church was rebuilt, the cedar roof starts leaking and inadequate repairs were made. Tarps were in place for years. According to members of the former congregation, the main church, the United Church Conference (UCC) wanted to close and sell St. John’s for up to ten years. The UCC refused to fund repairs. The roof continued to deteriorate and the congregation dwindled in numbers. Financial pressures mounted up to the fall of 2008, even though about 60% of church income came from rentals to community/arts groups such as the Rainbow Community Church, Rainbow Band, Weight Watchers, AA and other 12-step groups, Prime Timers, a gay square-dancing group, Vancouver School Board, boy cubs and scouts, band rehearsals, opera group rehearsals, various one-off rentals (elections, for example). The other big user was the Youth Search program, funded by the federal government and managed by Gordon Neighbourhood House. 1981. The church is rebuilt. 1974. A fire destroys the original building. 1903. A community formed, bought the property at Comox and Broughton Street and built St. John’s Presbyterian Church. The cornerstone was laid in 1906. “St. John’s was a great example of contemporary West Coast architecture – enriching in experience, well executed in materials, and environmentally sensitive. The large windows, cedar siding, and exposed wood …beams are all common features of the Pacific Northwest Regionalism style of architecture. Instead residents are anticipating St. John’s nightmare.